In a Northumberland hospice surrounded by various other colourful characters this once vivacious woman is preparing to say goodbye. Riddled with a cancer that has left her unable to talk, she is ready to make peace with life, her beloved sea-garden and the man she loves, Harold Fry. But a note that was to provide closure to one of the most important chapters in her life instead has left Queenie reeling with the news that her former colleague and old flame is walking – indeed, walking all the way from Devon across the whole of England to come and say a final goodbye. Rachel Joyce wrote The Unlikely Pilgrimage of Harold Fry which chronicled a senior citizen’s trek across the country as he strode towards an old friend in unlikely walking gear. But this is Queenie’s story, a tale told in parallel, a companion to the first rather than a sequel. This story begins in the twilight hours, in a hospice that although brightened with vivacious veterans of life still bodes the inevitable stillness that must come to all one by one– empty chairs, absent voices and pens that will at some point must be capped. Everybody has to play the game, the waiting game and at the recommendation from one of the new nuns, Queenie begins to write a letter for Harold. These letters go back in time, through memory, both its pains and pleasures to the first kindling of feelings, her relationship with his son and her own reasons for moving on and away from the man she dearly loved. Joyce is an evocative writer. She has a marvellous ability to capture dialogue and her rich descriptions effortlessly create visual landscapes. The nuns and the hospice are perhaps the most vivid scenes with the pathos and the dignity both captured in equal, genteel measure. 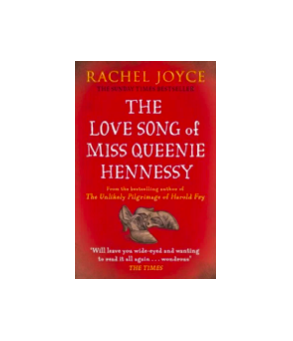 Harold as a character seen through Queenie’s eyes can do no wrong, such is her unrequited love, but his son is her weakness. There are secrets, not told with the grandeur of climax but quietly and intimately; reminisces that cherish the sense of being alone and yet never fully escape from the loneliness that has been enforced to some extent. The stories are always told through lenses of memory and perspective, and Joyce’s lightness of touch never lets us forget that we are privileged to be part of this final farewell. The segues work remarkably well too, the contrast between the past and the present, the illusions and the effects of the medication, the unattractive realities of sight, sound and smell all create a sensory aesthetic that becomes the tale as it does its main character. Strong, feminine and confident, Joyce’s is a touching and genuinely moving farewell, not a huzzah in any sense but a quiet pride and joy in sharing, living and telling one’s story. Joyce’s ability to create such a compellingly nuanced world, complete with all the residues and traces of life’s different chapters is an admirable feat. It is a work of fiction that captures those hours before the dawn, before the day that come to take a soul away – it is a walk, step-by-step through the silver hours of life.